DeFlaming, or to DeFlame, is the opposite of inflaming. In other words, DeFlaming is about reducing inflammation. This is a very relevant lifestyle consideration as almost all chronic aches, pains, and diseases are caused by chronic inflammation. Not well known is that poor nutrition, a lack of sleep, a lack of exercise, and stress all lead to chronic inflammation and eventually, this leads to the expression of chronic disease. The focus of DeFlame.com is about how poor nutrition promotes chronic inflammation, which leads to aches, pains, depression, fatigue, general ill health, and chronic disease. 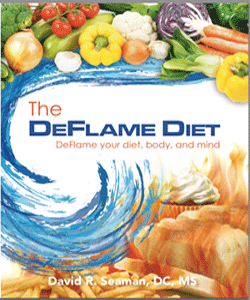 To combat chronic inflammation consider acquiring The DeFlame Diet book, DeFlaming supplements from Anabolic Labs, and consider DeFlame Consulting. To the right are additional ways you can DeFlame your life. Thank you for visiting and considering DeFlame.com as your reliable internet resource for inflammation reduction, which we call DeFlaming. Please follow us on Facebook, Twitter, and Youtube. You can sign up our e-newsletter at the bottom of this page.